What data do we use to define success? On Tuesday we are hosting a cocktail party for major donors – people who, over the 15 years of building the PlayHouse, have donated $5000 or more. The goal of this event is to thank them for what they helped us to create. I am struggling with my brief presentation to them. What information or ideas do I share to show them what a success this museum is? What data do I have to demonstrate this success? The easiest numbers to share are the attendance and membership numbers. They are easy because they are accurate (our point of sale system measures them for us), large (we have a lot of visitors and members) and clear (everyone understands what they mean). But they are also limited: They don’t say anything about what the visitor experience is like, or what the museum does for these visitors, or how the PlayHouse is anything other than an expensive indoor playground. Years ago, while working at the Guggenheim, my colleague Georgia Krantz and I wondered what new measures of success we could create, which the museum directors of the world would care about. The challenge is two-fold. First, how do we want to define success? And second, how do we measure these things? The numbers through the door are like the price of the glass or the bag in this advertisement: indicators that success is achievable, but not in and of themselves indicators of success. Without the child’s experience, the price of the objects themselves is meaningless. For now, I will need to substitute stories for numbers. Regular readers of this blog will know that I have strong concerns about storytelling in exhibits, because they are emotional, biased, and persuasive. But storytelling is an excellent tool for development, because they are emotional, biased, and persuasive. And for every one of these index numbers, I have, or can collect, numerous stories demonstrating that this is happening. But I would like to find ways to collect numbers related to this “Museum Index.” I wonder if this might be done, in partnership with experienced researchers, using clever questions and a limited sample to gather percentages (rather than total numbers). This, after all, is how the sources Harper’s uses often get their numbers, not by speaking with every household in the country, but by identifying a certain sample set and collecting data just from them. 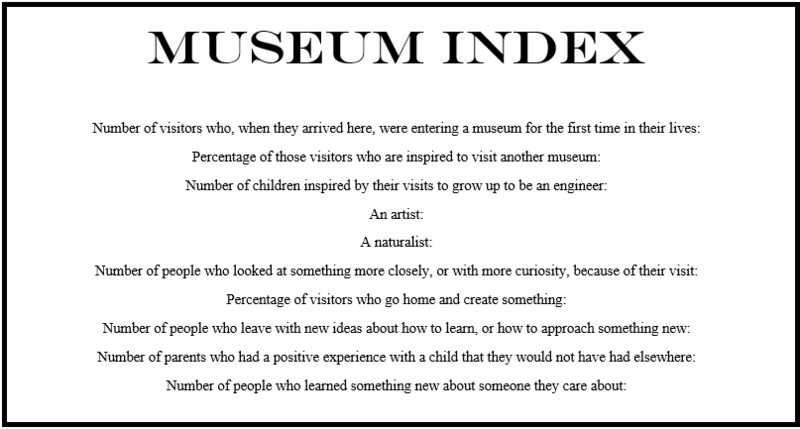 What is your “Museum Index”? What numbers do you collect, or would you like to collect? How can we measure, demonstrate, and identify success according to the “priceless” aspect of a museum visit? How do museums help to create a better world? ← When are education materials good marketing materials?